Mix the wine, garlic, paprika, clove, bay leaf and some seasoning. Add the pork, cover and leave for 2-4 hours (longer if possible). Drain the meat, reserving the marinade. Melt the lard in a large pan over a medium heat. Add the meat in batches, and fry until golden-brown. Return all the pork to the pan. Strain the marinade and add to the pan. Cover, bring to the boil then reduce the heat and simmer gently for about 1½ hours until the meat is very tender and the liquid reduced by half. Meanwhile, heat the olive oil in a large casserole with a well-fitting lid (or a special cataplana dish). Add the onion and fry until soft, then stir in the tomato purée and parsley. Season. 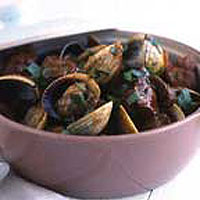 Cook for a minute then add the clams and, as soon as they open, add the cooked pork and its liquid. Adjust the seasoning, then cover the pot tightly (or lock the cataplana dish). Simmer for a couple of minutes, then take to the table and serve directly from the pot. The classic accompaniment is fried, diced potato.